Mr. Potter does the impossible! He gives his opponent the terrific odds of a Queen, makes only six moves and then announces a forced checkmate in nine more moves! 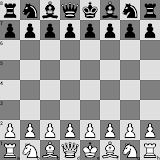 Game 5 from 1,000 Best Short Games of Chess, by Irving Chernev.